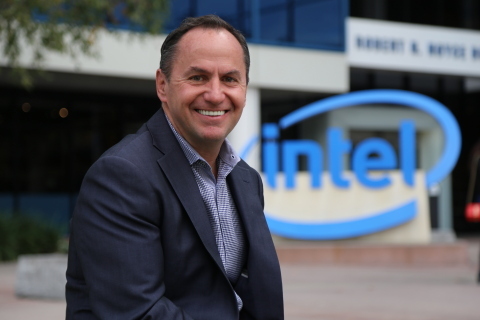 SANTA CLARA, Calif.--(BUSINESS WIRE)-- Intel Corporation (NASDAQ: INTC) today announced that its board of directors has named Robert (Bob) Swan as chief executive officer. Swan, 58, who has been serving as Intel’s interim CEO for seven months and as chief financial officer since 2016, is the seventh CEO in Intel’s 50-year history. Swan has also been elected to Intel’s board of directors. Statements in this press release that refer to future plans and expectations are forward-looking statements that involve a number of risks and uncertainties. Words such as "anticipates," "expects," "intends," "goals," "plans," "believes," "seeks," "estimates," "continues," "may," "will," "would," "should," "could," and variations of such words and similar expressions are intended to identify such forward-looking statements. Statements that refer to or are based on estimates, forecasts, projections, uncertain events or assumptions, including statements relating to total addressable market or market opportunity and anticipated trends in our businesses or the markets relevant to them, also identify forward-looking statements. All forward-looking statements included in this release are based on management's expectations as of the date of this release and, except as required by law, Intel disclaims any obligation to update these forward-looking statements to reflect future events or circumstances. Forward-looking statements involve many risks and uncertainties that could cause actual results to differ materially from those expressed or implied in such statements. Important factors that could cause actual results to differ materially from the company’s expectations are set forth in Intel’s earnings release dated January 24, 2019, which is included as an exhibit to Intel’s Form 8-K furnished to the SEC on such date. Additional information regarding these and other factors that could affect Intel’s results is included in Intel’s SEC filings, including the company’s most recent reports on Forms 10-K and 10-Q. Copies of Intel’s Form 10-K, 10-Q and 8-K reports may be obtained by visiting our Investor Relations website at www.intc.com or the SEC’s website at www.sec.gov.